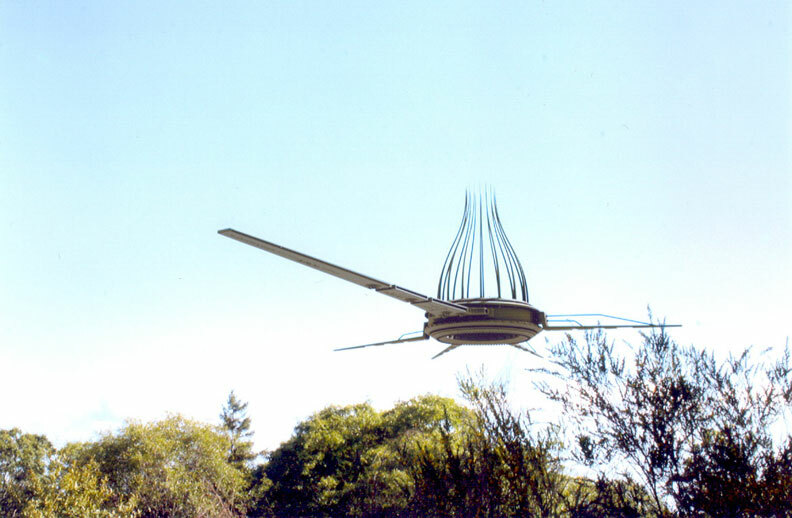 For years I have been fascinated by the events of 2006 / 2007 when more than a dozen different witnesses in different parts of the United States and further afield reported seeing weird dragonfly drone-like aerial objects in broad daylight. Described as having a “ring body” with a tail and “appendages”, the craft were slow moving, usually silent, or if anything they emitted a static, crackling, or sound of high voltage usually accompanied by the feeling of a static charge in the air. Popular investigative news site Earthfiles.com, written by Linda Moulton-Howe covered the ever evolving story as one after one, new witnesses, testimony and photos emerged throughout 2006 and 2007. Linda had taken to calling them drones since the bodies of the craft were only described as a maximum of two feet thick and therefore not capable of being piloted by humans, but rather they appeared to be being remotely piloted or controlled by some other means. 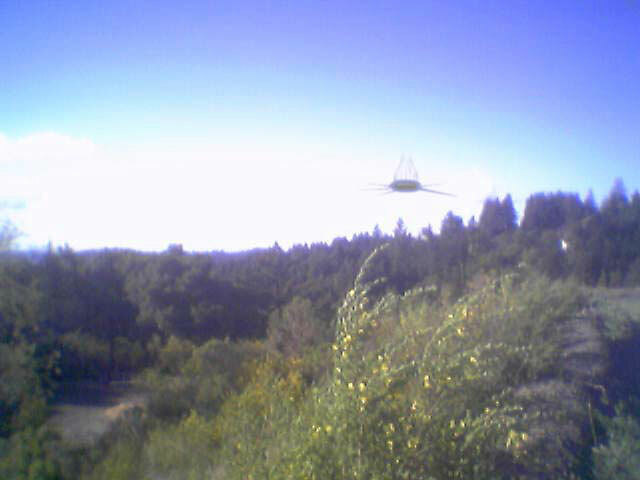 The first photo taken of the craft with a cellphone camera (2007 standard). 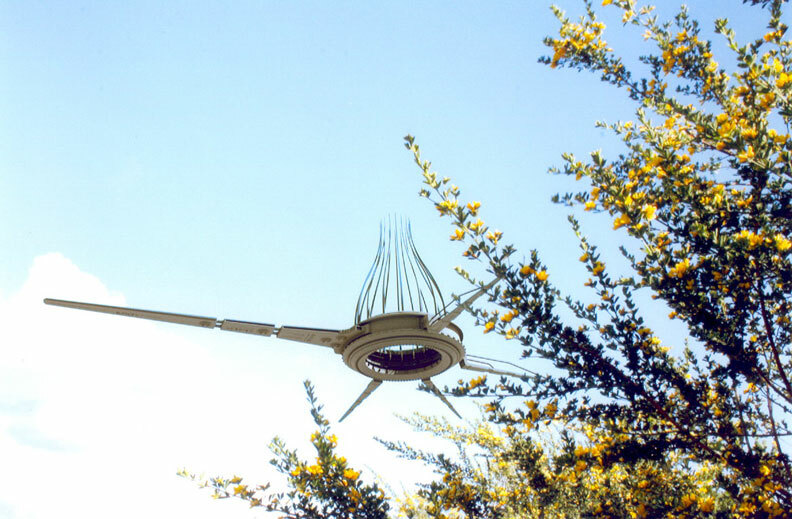 Perhaps due to the impressive full colour daylight photographs of these craft, elements of the UFO community debunked the story, contrary to the massive breadth and depth of evidence. A series of badly thrown together CGI movies then followed – produced by fame-seekers, copycats and those seeking viral video status – none of which came close to resembling the original images. It is my view that most people dismissed the phenomena without looking at the weight of evidence and testimony in it’s entirety. There is much to this story and it cannot be easily explained in one single article – so I will be presenting the subject over a series of articles looking at each sighting and the supporting information again. I have waited for several years now for new information and reports to emerge, but the subject has turned into a bit of a UFO cold case. Therefore, I am writing this series of articles with several objectives in mind. In an effort to hopefully reinvigorate and re-awaken the investigation, to focus attention back on this real phenomena, to bring forward possible new witnesses, to make contact with old witnesses and perhaps even encourage Isaac to release more of his cache of C.A.R.E.T. (Commercial Applications Research for Extraterrestrial Technology) documents into the public domain. On May 11th 2007, a series of 6 photos were sent to webmaster Lex at popular radio program “Coast To Coast AM“. 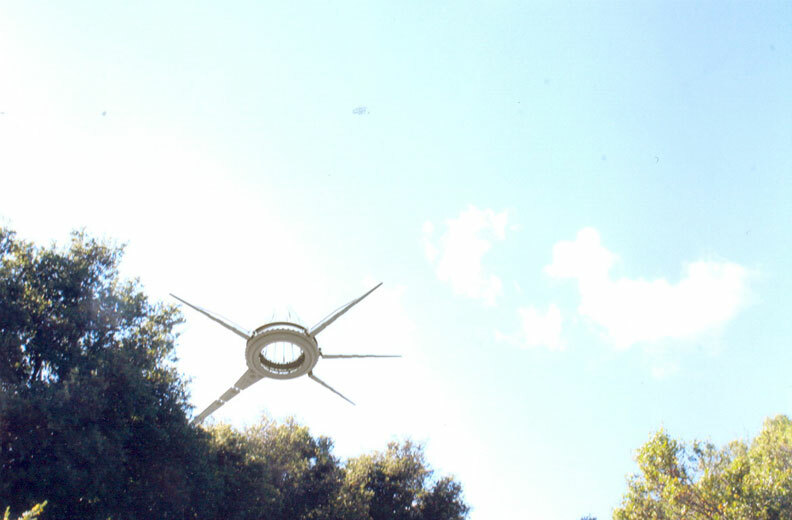 The photos dated May 6th 2007, were taken by a Central California resident calling himself “Chad” and were accompanied by a brief explanation as to how he had came about these images. Although this was technically not the first sighting, (as we will discover in a later article), the “Chad photos” are generally accepted to be the most prolific sighting and catalyst for bringing this bizarre phenomena to the public gaze. Below (in his own words) is the exact email that Chad sent to Coast To Coast AM back in April/May 2007 and the same 6 photographs he sent to them. Underneath the craft strange hieroglyphics are evident – they do not match any known language. 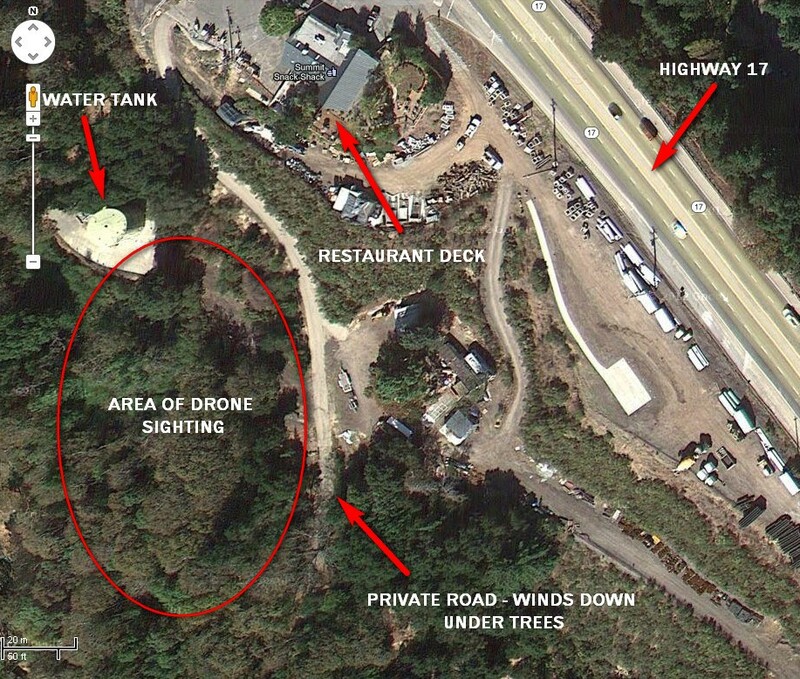 The Chad drone photos were originally stated to have been taken in Bakersfield, but keen-eyed members of the public later identified the actual site as just off Highway 17, near the restaurant known as the “Summit Snack Shack” or “Summit Roadhouse” as it was later renamed, which at this point runs parallel to the old Santa Cruz Highway approx 4-7 miles south of Los Gatos, Santa Clara County, California. Los Gatos is the nearest town approx 4-7 miles North. At the time (in 2007) part of the land from which at least two of the photographs appear to have been taken reside on private property. 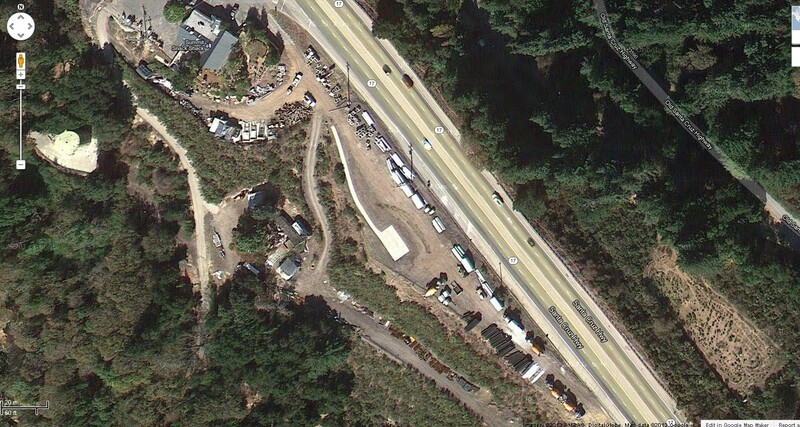 One or more of the photos appear to have been taken from the dirt track / road at the rear of the restaurant deck area. Despite bordering on what some have said is “private land”, it is easy to see how someone could easily access these areas and not even realise they were on private property. It was perhaps always assumed that Chad and his girlfriend had been “hikers”. However, in the original email Chad simply says he and his girlfriend were out on a “walk” and he said that he had seen it maybe eight times before from his house. So perhaps then, Chad and his girlfriend did not walk here and enter through the front of the property as initially assumed – perhaps they actually reside in one of the private houses down the hill and that they WALKED UP the hill towards the back of the restaurant. Chad admits he is a local who has seen this craft on many occasion from his house along with several of his neighbours. So since he is a local, he would have had a reasonable knowledge of the area, the roads, the houses and there would be a good chance that he knows the owner of the property, so there would be no cause for concern by the owner of anyone trespassing. It is entirely possible that the reason Chad was so spooked by these things is that he actually LIVES closer to the location of the photos than we think – perhaps the drone has even flown directly over his house. 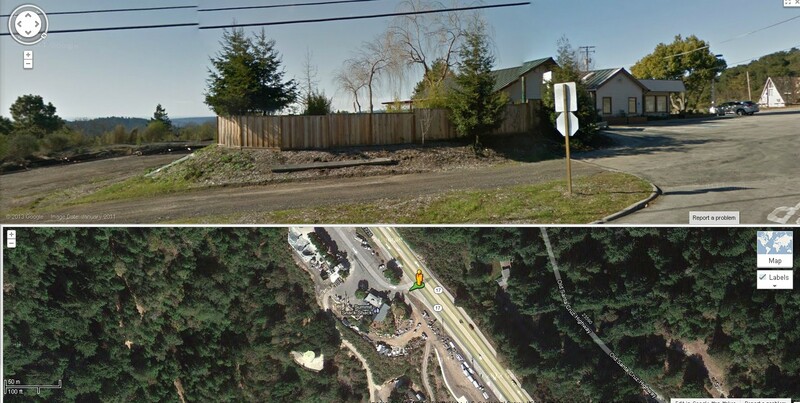 Google Streetview and aerial shot of location as it looked circa 2012 – the craft would potentially have been visible to cars driving along the Highway. Aerial image of the CHAD location. 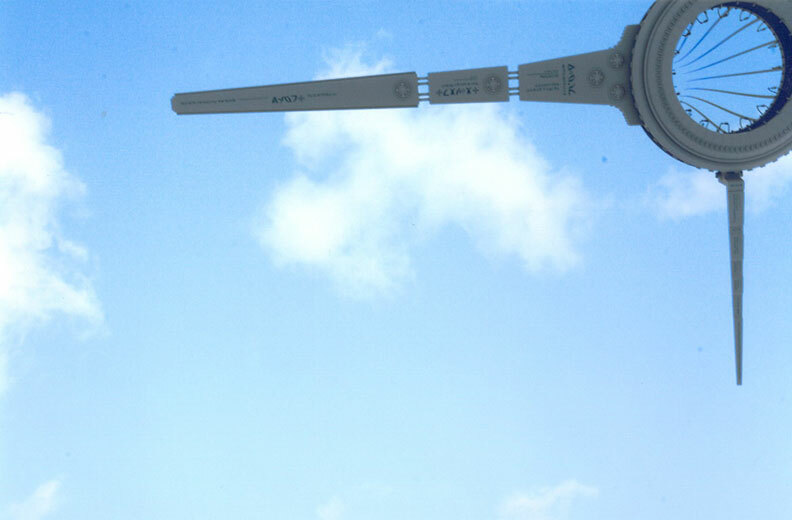 There seem to be many people out there still fascinated by these strange events back in 2007/2008, especially as they relate to something so bizarre and (if proven true), certainly some of the clearest daytime photographs of unusual aerial phenomena ever recorded. Some individuals who were equally keen to get to the bottom of the mystery setup a website a few years ago to research all aspects of the phenomena. Droneteam.com, which is still active today (albeit very quiet), was setup by a group of like-minded individuals to get to the bottom of the drone sightings. Their efforts paid off as they made some reasonable progress in uncovering locations from photographs and gathering the facts of many of these sightings. Anyone interested in this subject is encouraged to go there and research further as it is a great information resource on this subject. The people behind droneteam.com ended up hiring local private investigators Tom Davis and Frank Dixon of TK Davis Investigations to investigate the drone sightings. The pair (both in their 60′s at the time) were tasked with finding new leads, identifying locations and pursuing avenues of enquiry in an effort to uncover the truth. An article in the LA Times and an interview for Fox News featuring the PIs helped publicize the story to a wider audience, but as would be expected, the mainstream media was more interested in presenting the story in a less than serious manor despite the serious implications of covert monitoring by unknown drone craft. Today, the original TK Davis website is no longer active, so I am guessing they have probably retired from the PI business. You can still checkout the website as it was back then in 2007 if you use the internet archive Wayback Machine. After Chad’s initial contact with Coast to Coast AM, Linda Moulton-Howe of Earthfiles.com corresponded with Chad over a series of several emails. In a podcast she admitted to having Chad’s real name, address and details – so this lends more credibilty to his testimony. After the exchanging of some emails for a while Chad then stopped responding and ultimately the trail of this particular sighting has gone cold. 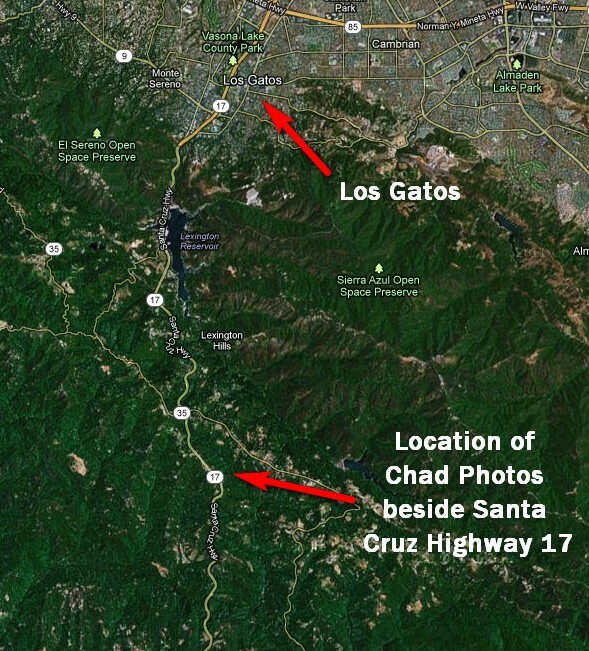 To my knowledge Chad has never been identified and nor has his house in the valley near Highway 17 from which he saw these objects on eight separate occasions. 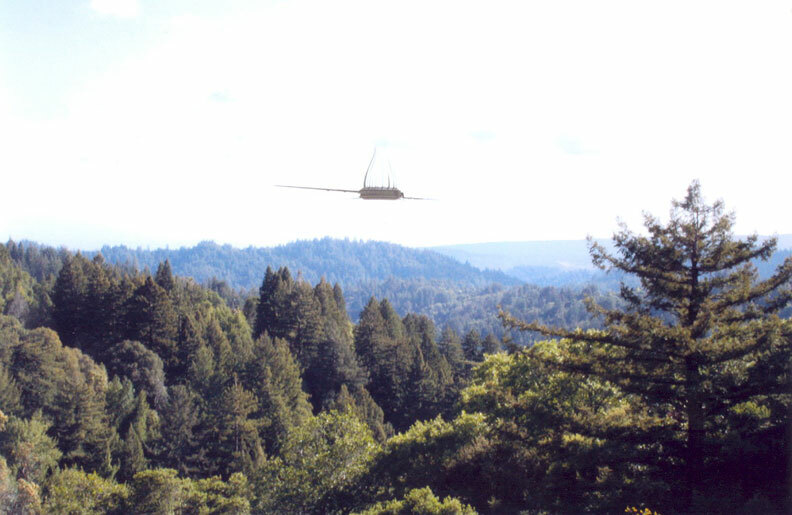 In the next article in this series examining the strange drone craft I will be reviewing the Lake Tahoe sighting which occurred on the 5th May 2007. What information do YOU have about these things? I am very interested to hear from you if you have you have had your own personal sighting of one of these drones. If you know someone who has had an experience with them. Did you work at the Palo Alto CARET Laboratory? Do you have photos of unexplained objects similar to this? Have you been keeping information on this subject to yourself for a time and now want to share? I would encourage you to contact me with your information. You can reach me at contact@overunity.co – or private message me through our special Drone Facebook Page All requests for confidentiality will be respected and treated in the strictest confidence. You’re welcome. Do your homework better. I’m afraid it is YOU who needs to do your homework better. I spent a long time researching the Dronehoax site myself and to be quite honest it doesn’t stand up to scrutiny. It’s a bit of a lame attempt to explain everything away yet they do not answer a lot of fundamental questions. In the end there were over a dozen witnesses all accross the US and even one in Patten, Holland. It’s a real shame that people see the dronehoax site and don’t even get as far as the hours and hours of witness testimony. That’s ridiculous. That site not only documents every single individual involved in the hoax, but all of their public interactions as well as private conversations. There is no greater record of this occurrence than what is on that site. Your dismissal of volumes of evidence is shocking. Those “hours and hours” of witness testimony you claim exist have absolutely no relation to the Chad/CARET drone, what-so-ever. You are attempting to take a known hoax and marry it to an existing unexplained phenomena. For all of the “hours and hours” of witness testimony and for as widespread as you claim these sightings have been, and for as popular as the hoax became, there has never been a single piece of photographic or video evidence of these craft that did not originate with the original hoax or its investigation. Dr.Dil, the author of the dronehoax website, participated frequently on our forum, amkon.net, and the Chad/CARET subject was discussed there in its entirety… as it was at several other places. I certainly cannot stop you from posting your blog, but the fact that you do not even present the existing evidence on DroneHoax.com with anything more than an aloof dismissal belies your own personal bias. What nonsense. The dronehoax site is a hodge-podge of badly thought out theories and cobbled together statements from known hoaxers and CGI artists (who by the way, barely come close to emulating the Chad photos) which have been assembled to reflect the beliefs of a pseudosceptic audience. The dronehoax ‘site’ is so badly skewed with unfounded pseudoscepticism and outright denial that it is hard to read it with a straight face. I am judging by the overtly negative bias you have towards this phenomena that you too are in what I would call the pseudosceptic camp. While scepticism is healthy, pseudoscepticism and establishment bias have no place on this website. The dronehoax website no longer functions. The site isn’t even active anymore (June 2014), so the drone hoax IS dronehoax.com – like the majority of debunkers, these people are the worst kind. Bad CG hoax. Debunked ages ago. I won’t get into the fake/non fake aspect of this, But will take note of something. The picture was taken around 7pm,. In the picture’s you will see “Blooming” of the cell phone camera caused by it being pointed at the sun. Also one other note. If you look at the eave of the roof of the house/building it is very easy to see that it is not taken care of at all. the paint is very old and mostly flaked off. I suspect the trees have grown a bit in 5 years, but maybe those clues would narrow down the location. Are you claiming to be THE Dr. A. Reyes who allegedly was Isaac? If that is the case (or if you were his colleague or a close friend “in the know”, you can so easily blow his cover and potentially put his life in jeopardy? Some friend! More of a jealous colleague’s behavior. Even more the behavior of some sad, bitter a-hole.